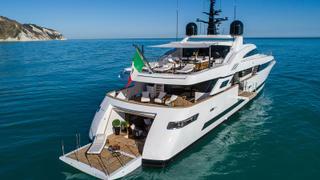 First look photos have been released of the recently delivered ISA Alloy 43 motor yacht Agora III. We discover some of her best features... Here is a comprehensive look at the lower deck beach club, which is revealed through the fold-down transom door. Here is a comprehensive look at the lower deck beach club, which is revealed through the fold-down transom door. 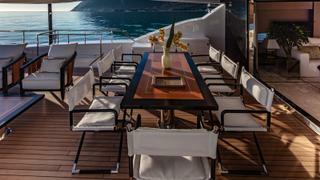 There are numerous dining areas on board Agora III, both covered and open. 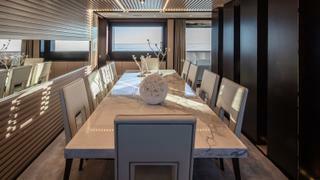 The interior style on board Agora III has been "designed with the aim of conferring a refined, elegant and personalised look," the yard said, evident here in the dining area styling. 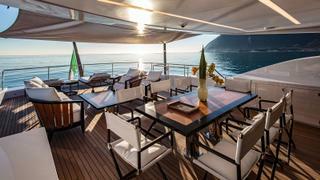 Another dining and lounging area on board Agora III. 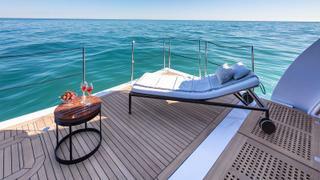 The yacht features interior and exterior design by Luca Dini. 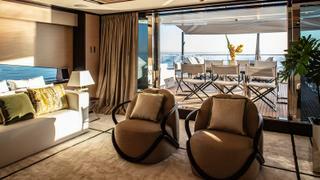 Numerous materials have been used to furnish the interior, including precious stones, woods and silks. The full beam owner's suite is located forward of the main deck. The comprehensive owner's suite also includes an anteroom connecting the bedroom to the owner's dressing room and office. Inside spaces have been designed for a strong interaction with outdoor spaces. 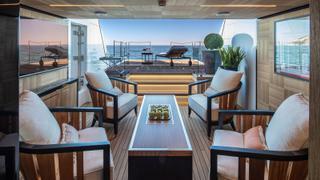 Direct contact with the sea is achieved thanks to fold-out balconies near the lounge area of the main deck.